The Ducks have acquired left wing Luca Caputi from the Toronto Maple Leafs in exchange for left wing Nicolas Deschamps. Caputi, 23 (10/1/88), has appeared in 21 contests for the Toronto Marlies of the American Hockey League (AHL) this season, collecting 2-1=3 points with 10 penalty minutes (PIM). 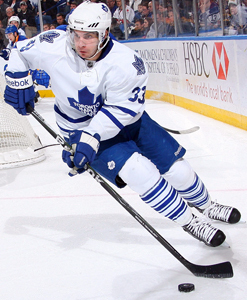 The 6-3, 200-pound winger split time with the Maple Leafs and Marlies in 2010-11, appearing in seven NHL contests with the Leafs, going scoreless with four PIM. In addition, Caputi collected 1-4=5 points with 30 PIM in 13 games with the Marlies in 2010-11. A native of Toronto, Ontario, Caputi made his NHL debut with the Pittsburgh Penguins in 2008-09 and scored his first career NHL goal Feb. 3, 2009 at Montreal (Carey Price). Caputi appeared in a career-high 23 NHL contests with Pittsburgh and Toronto in 2009-10, scoring 2-6=8 points with 12 PIM. He was acquired by Toronto from Pittsburgh with Martin Skoula in exchange for Alexi Ponikarovsky on Mar. 2, 2010. Originally selected by Pittsburgh in the fourth round (111th overall) of the 2007 NHL Entry Draft, Caputi has appeared in 154 career AHL contests with Wilkes-Barre/Scranton and Toronto, notching 44-56=100 points with 146 PIM. He scored a career high 2-2=4 points on Feb. 17, 2010 in a 9-2 Wilkes-Barre/Scranton win over Albany. Caputi has also appeared in 31 career Calder Cup Playoff contests with Wilkes-Barre/Scranton, scoring 7-9=16 points with 18 PIM. He advanced to the Calder Cup Final in 2008 with the Penguins, falling to the Chicago Wolves in six games. Caputi also appeared in 214 career Ontario Hockey League (OHL) contests from 2004-08, scoring 86-99=185 points with 241 PIM and a +36 rating. In 2007-08, Caputi ranked third in the OHL in goals (51) and fourth in points (111), and was named to the OHL’s Second All-Star Team. Deschamps, 21 (1/6/90), appeared in 31 contests with the Syracuse Crunch (AHL) this season, collecting 5-2=7 points and 10 PIM. The Lasalle, Quebec native appeared in his first full professional season with Syracuse (AHL) in 2010-11, collecting 15-31=46 points with 26 PIM in 80 games. In 113 career AHL contests, Deschamps has scored 20-34=54 points with 36 PIM. Selected by Anaheim in the second round (35th overall) of the 2008 NHL Entry Draft, Deschamps also appeared in 199 career Quebec Major Junior Hockey League (QMJHL) contests, earning 87-141=228 points with 143 PIM and a +25 rating.